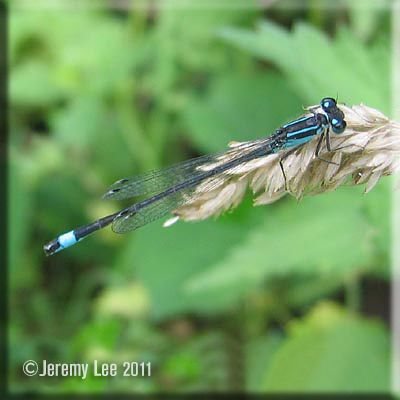 Best distinguished from the similar Common Blue Damselfly by the thinner blue stripes on its thorax. The female is much darker with mainly black markings on its abdomen interspersed with greenish rings. Abdomen usually black with 8th segment bright blue in both sexes, but female sometimes lacks blue. Pterostigma bicoloured. Catches prey in flight or on leaves of foliage or even from spiders webs. Found around still waters of all kinds, including polluted ponds, and are widespread and common throughout most of the UK.